An afternoon spent planting blueberry bushes is time well invested. A strong plant in a good location needs little maintenance and will produce berries for many years. Blueberries are usually hardy and easy to grow, but they are particular about soil conditions. A bit of time spent on careful site preparation will be rewarded with a harvest of tasty, nutritious blueberries for years to come. The ideal location for planting blueberry bushes is on a sunny hillside with good drainage. Blueberry bushes will tolerate partial shade, but a sunnier location generally encourages a higher production of flowers and berries. Good Drainage: Blueberry bushes have delicate root systems and will suffocate without adequate aeration. Sandy loam soil with a good proportion of organic matter is ideal. Low-lying locations close to the water table or heavy clay soils are generally unsuitable for blueberry bushes. Acidic pH: While they may tolerate pH values up to 5.5, a pH value of 4.2 to 5.0 is optimum for growing blueberries. Soils with pH higher than 6.5 are generally unsuitable for blueberries, but anything lower than that can be brought down to optimum levels with the addition of garden sulfur. Soil pH meters and test strips are available at most garden centers and are a good gardening investment, as many plants besides blueberries have specific soil pH requirements. Organic Matter: Blueberries like a lot of organic matter in the soil. A good mix of compost or peat moss will keep the soil structure and drainage at a good level, and will help to acidify the soil. Patience is a valuable attribute in a would-be blueberry grower. For optimum results, blueberry planting sites should be prepared a full year before planting. This may seem excessive, but for a plant that will bear fruit for up to three decades, it is a worthwhile effort. Prepare the beds or rows. If your soil has heavy clay content, is close to the water table, or has a pH above 6.5, a raised bed garden with brought-in soil is the best site for your blueberries. Other soils will likely need at least a few amendments before you make your rows. For either choice, space rows about five feet (1.5 m) apart to allow walking space between bushes and to keep your plants from competing with one another. For sites with soil pH between 5.5 and 6.5, apply sulfur according to package directions to bring the pH down to optimum levels. Sulfur acidifies the soil gradually over a period of months, which is why the site usually needs to be prepared well ahead of time. Work four to six inches (10-15 cm) of peat moss, compost, well-rotted manure or aged sawdust into the top six to eight inches (15-20 cm) of soil. Remove all weeds within two to three feet of your planting site, preferably in the spring before seeds develop. Most weeds compete strongly with blueberries for available water and nutrients. Once you have carefully and lovingly prepared your planting site and patiently waited for the sulfur to do its job, you are finally ready for planting blueberry bushes. Plant in early spring, as soon as the soil is workable and the danger of frost has passed. Purchase your blueberry bushes as close to planting time as possible. If plants need to be stored for a short period of time, spray the roots with a mist of water and keep them in a cool, dark place. When ready to plant, follow these steps to give your bushes the best start. At the time of planting, pinch off any flower buds to encourage root development. Allow three to five feet between bushes within each row. Using a small spade or trowel, dig a hole slightly deeper and wider than the root mass for each blueberry bush. Place the root mass in the hole and spread the rootlets out as much as possible. Fill in the space with soil and firm down around the roots, being careful not to use enough force to damage the tender rootlets. Water thoroughly and cover with a wet mulch of compost, sawdust or straw. 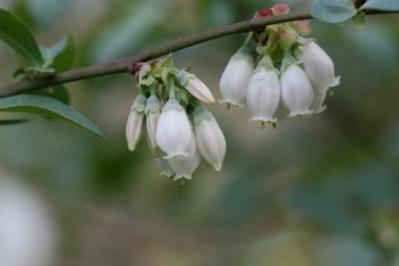 Most blueberry bushes will produce a few berries in their first or second year, but do not expect a big harvest until the bushes are well established. Yields will increase each year until your plants reach maturity at six to eight years old, at which time they could produce as much as five to ten pounds of blueberries per bush.